Making sense of your product data with a well-rounded architectural approach! Data is everywhere, and the things you can do with it are amazing. You can reinvent your business, improve efficiency and help your employees do their job better. Data tells you who your customers are, what engages them and how they use your company’s products. It allows you to make more informed decisions and identify the products, services and processes where your business isn’t delivering the best possible results. We use data to describe our products through their whole lifecycle. Large amounts of information are created and used to develop, sell, deliver and service the product. From bills of materials (BOMs) to product configuration rules or analytic models, a vast variety of data is relevant to the lifecycle. This data is managed in different systems: Computer-aided design, ERP and manufacturing execution systems, all the way down to automation systems on the factory floor. Each of these systems is designed to support different actors and phases of the product lifecycle. We can’t just dump all our product data into one system and expect that it will work in every part of the product lifecycle. The goal is to tie it all together to make the most of it. But each business is unique, and usually no “off-the-shelf” solution is available. “Good data” is reliable data under control. It’s quality data that’s easy to find and available when needed. But data silos are still a common problem in most organizations. These silos kill the ability to share, collaborate, and embrace data as a competitive advantage. And data is not cheap. Challenges related to data silos, skill sets and poor technology come to the fore when it comes to converting data into actionable insights. Organizing product information and providing access to clean and trustworthy data are major challenges in PLM. If product data isn’t managed properly, we’re likely to encounter quality and efficiency issues, and we won’t be able to embrace the full power of advanced analytics. WHAT KIND OF DATA IS OUT THERE? Before we move forward, let’s standardize some of the vocabulary we’ll use as we talk about data. Data in traditional row-column databases is considered structured data. Structured data can be transactional or master data. Transactional data describes business events – for example, buying products from suppliers or selling products to customers are both business events. Master data is data that remains unchanged over time. It describes key business entities such as products, suppliers or customers. Wait, give me an example! Imagine that you’re going to purchase a computer. The master data describing the computer includes, among other data, the manufacturer’s name, the model series and the monitor size. The master data that describes you as a customer includes your name, email and billing address. The transactional data involved here would be the computer’s price, the current discount or the method of payment. Unstructured data is data that isn’t specifically structured to make it easy for machines to understand. It doesn’t conform to a specific, pre-defined data model. Unstructured data can be e-mail messages, documents, videos, photos, audio files, presentations, etc. After buying your new computer, you call your friend to tell him about your purchase. The audio file of your conversation is one example of unstructured data. 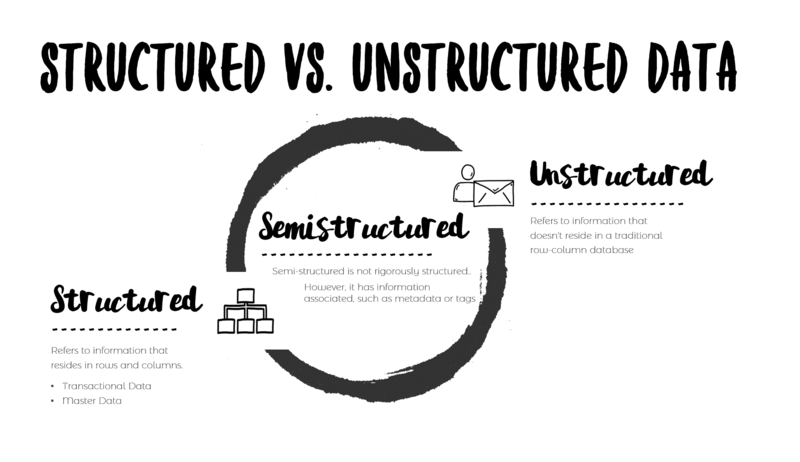 Some experts believe that the term “unstructured data” is misleading, because the files usually contain metadata produced by the software they were created with. However, what is internal to the document is truly unstructured. Chuck Densinger and Mark Gonzales, in There’s no such thing as unstructured data discuss this topic in detail. For example, if you take a picture of your new computer, your camera will probably store the date and maybe the location where you took the picture. You might also upload the picture to social media and tag it with the words #computer or #newtoy. In some sense, you’re categorizing the file and making it a bit easier for machines to extract insights from your data. To get business value out of the data, organizations must combine unstructured and structured data wisely. Let’s use the knowledge buried within our data to make better decisions and improve performance. That’s the universal goal – but the reality is far different. The fact is, the Information Revolution hasn’t lived up to its promise for most companies. Isolated islands of unconnected data and a lack of skills and talent are among the major challenges. What can you do to unlock your information? The recipe for success begins with a well-considered architectural plan. Information must be consolidated in a meaningful way, and architecture is the glue that holds it all together. A good approach is to start with the right questions. What information will help your employees do their job better? Where could data provide a tangible benefit so that you can sell more and offer better services? You need to identify what data your business requires, where you can get it from, and how you’re going to use it. This 7 steps provide a simple checklist to help you get your data out of the silos and put your information in action. 1. Set clear goals for your data initiative. How do you eat an elephant? One bite at a time. We all know the saying, but we often fail to apply this lesson when it comes to Data Management. We usually bite off more than we can chew, and get choked up. Then we get lost, overwhelmed, and frustrated with our messy data. And in the end, we fail. We run out of budget and fail to achieve any tangible results. Everybody is disappointed. First thing you need to do is review and clarify the results you want from your data initiative. What outcomes are you trying to achieve? Do you want to improve data quality? Extract insights from your customer data to improve your products? Are you willing to provide clear instructions to improve the efficiency of your organization? Having a clear picture of what success looks like, what your main stakeholders expect of your initiative, and the main benefits your organization will obtain will help you to focus and start slicing the elephant. Break your data down into dimensions. Key dimensions can be data about customers, products, employees, inventory, suppliers, locations, etc. Analyse which of the dimensions you identified is strategically more important. Take that dimension, and learn what data is used where, by whom, when and why. It’s crucial to analyse the complete process, as the same data might be created or used by different stakeholders at different phases in the product lifecycle. Find out what attributes describe those dimensions in each lifecycle stage and system. You’ll probably discover that the same data is named differently in different systems. Document the information flow “as-is”, while identifying inconsistencies, pain points and possible improvements. An attribute dictionary is a set of common attributes used by multiple systems and stakeholders. The attribute dictionary manages the attributes’ ID, name, definition, data type and other relevant metadata for the corporation (as, for example, its units of measure). This is a powerful concept, as it standardizes attributes and attribute definitions that are common across multiple systems. It eases integration and empowers interoperability. This step involves going through all the attributes you have identified for one dimension and mapping them to the common dictionary attributes. Often, the same thing will be named differently in each system. Even within a single system, multiple attributes are often used to define an identical property in different lifecycle stages or processes. Once you have a common definition for all the attributes that refer to one dimension, draft the information flow again using the common dictionary attributes. Try to group attributes logically, based on process, activity or lifecycle stage. As soon as you have a clean information flow defined, ask yourself: Who are the data producers and data consumers at each lifecycle stage? The main goal is to define in which system attributes sets are mastered, and by whom. It’s also important to identify who consumes that information and to which applications the attribute sets must be published to. In following example, the Product developer masters the material attribute set in PDM through research and design. This information is published to CRM, ERP and CPQ. Then the Manufacturing manager takes the material attribute set and masters it in ERP, publishing it to CRM, MES and PDM. 7. Plan the implementation, estimate the costs, and define the business case. As you have now a clear idea of how the information should flow, it’s time to plan the implementation. The attributes need to be adjusted to the dictionary, and interfaces between systems must be redesigned. Sketch a plan, and define a business case. Again, you need to break the implementation into pieces and prioritize strategically. Which areas will bring quicker wins? Once your implementation project gets the green light, it comes down to the dirty details that matter more: tuning the systems and making sure the information flows smoothly. 8. Document and communicate the changes. Finally, document the information flow, new data models, and instructions. Communicate the changes, and make sure all stakeholders understand how they need to work with the data. Becoming a data-driven organization is at the top of the agenda for leading companies aiming to outperform their peers. Information drives your organization forward and differentiates you from your competitors. But for this to happen, data must be treated as a true corporate asset. The company must invest and secure the required resources to leverage new business models that exploit data. Effective information management requires a big commitment from the top.